In August 2016, D.C.-based nonprofit Search for Common Ground was in about 12,000 square feet at 1601 Connecticut Avenue NW and wanted to reduce its office costs and square footage. Cove—a coworking company with hot desks—offered to instead create a private “hub” for the nonprofit at one of its existing coworking locations. 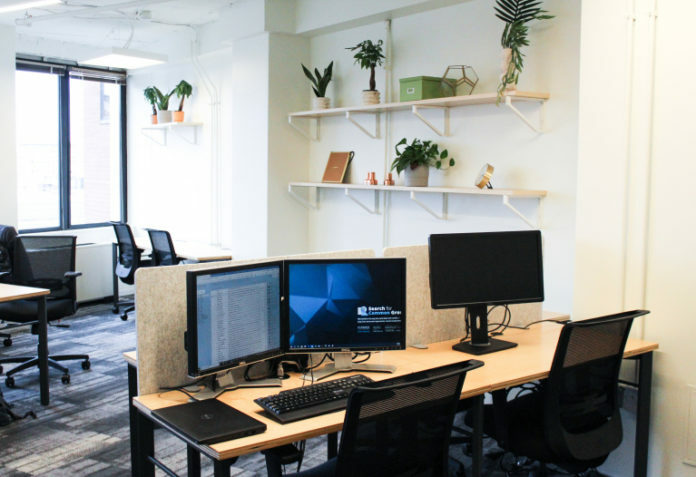 The hub allowed Search for Common Ground, which employees 700 people worldwide, to sublease half of its space at 1601 Connecticut Avenue NW to another tenant. A year and a half later, the nonprofit’s lease was expiring and it didn’t want to make another long-term commitment as it was considering its “long-term presence in the U.S.,” said Brad Fondak, the group’s senior manager of shared services, “so that took off the table quite a few traditional lease environments.” The nonprofit’s executives looked at another coworking space but it wouldn’t have been ready before the lease expired. Then, Cove swooped in with a new concept, coveHQ. Like coworking giant WeWork, coveHQ is an offering for enterprise clients, but with more private and individual amenities like kitchens and conference rooms. Launched less than three months ago, coveHQ—with one location at 1730 Rhode Island Avenue NW, near Dupont Circle—has five tenants, many of which learned about the concept by word of mouth. Cove’s co-fonder and CEO Adam Segal said that two more locations, in downtown D.C. and Arlington, Va., are in the works. Ross Nover, the cofounder of D.C.-based firm Friendly Design, found out about coveHQ from a friend who worked out of a Cove neighborhood location. Nover was seeking a new office option after working independently for six years out of a coworking space with Canvas, which was shuttering its operations. Having grown to a team of eight from two, Nover wanted more space and privacy. “We saw a lot of different [traditional real estate] but this option felt like a good in between—a little bit of coworking and a little bit of your own space altogether—that sounded great so we figured we’d give it a shot,” he said. Cove has five locations in D.C.—in Capitol Hill, along the 14th Street Corridor and in Chinatown and Columbia Heights—spanning a total of 30,000 square feet—and a 1,500-square-foot location in Boston. Members pay $79 per month to work at Cove on nights and weekends and $229 a month any time of the day (most locations close by midnight). CoveHQ tenants pay upwards of $5,000 per month. Cove members and coveHQ subtenants have access to all of Cove’s neighborhood locations. CoveHQ, with its leases of two to three years, seems to marry the collaborative and “convenience” aspects of coworking, the leasing flexibility of spec suites and the custom buildouts of traditional office leases. Spec offices have been catching on in D.C. because of their flexible lease lengths, which average five years in the D.C. region, according to a report from Newmark Knight Frank. As of August 2018, there were about 624 spec suites on offer in the D.C. region, as Commercial Observer previously reported. There’s a demand for them in the region, in part, because firms are hesitant to ink long-term deals due to uncertainty about future staff needs, per the report. According to NFK, spec suites also appeal to firms that have outgrown the collaborative nature of coworking spaces—a concept that some coworking providers reject. “Most of the members who leave usually do so because they outgrow the available space, not the experience,” said Uri Bar-Joseph, the vice president of marketing for Mindspace, a global coworking company catering to large enterprise firms such as Microsoft, Spotify and Samsung. Developers are even moving into the spec-space area. Washington Real Estate Investment Trust (WashREIT) in August 2018 launched a program called Space+, as CO previously reported. “Since we formally launched the Space+ brand, I think activity has been very strong,” Chang said. With 6.1 million square feet of commercial properties across the region, WashREIT currently has 53 spec suites spanning 133,000 square feet across multiple buildings in its Space+ program with a combined occupancy rate of 86 percent, Change said. An additional two dozen spec suites are under construction. Space+ tenants include Capital Sports Ventures, Modern Luxury and Digital Spec. Asking rents at two Space+ locations—Arlington Tower in Rosslyn, Va., and 2000 M Street M Street NW in D.C.—range from $53 to $60 per square foot, Chang said. “And across our portfolio, we’re able to offer price points across the value spectrum because of the diversity of our commercial [properties].” As far as lease terms, Chang said WashREIT recently negotiated a Space+ deal with a tenant for as little as eight months. When one firm had a stressful event coming up, she created a relaxation room with yoga mats, essential oils, Play-Doe and coloring books. She has planned an off-site holiday party and weekly breakfasts and lunches. “Our idea is to cut down on distractions and bumps in the road so that people can come in and do what they do best,” she said. CoveHQ firms also have access to the custom-built tech platform that was originally created to manage Cove’s locations. Segal said that the platform is especially useful for firms with more than 20 people who need to keep track of where everyone is on any given day. Employees can use tablets to check in to the office and reserve meeting rooms. It also has a way for them to chat with coveHQ’s onsite manager. For its first coveHQ space, Cove signed a three-year lease with Blake Real Estate for about 17,000 square feet across three floors at 1730 Rhode Island Avenue NW in June 2018. The asking rent at the building is currently $47 per square foot, according to Owen Billman, the president of Blake Real Estate. The majority of coveHQ’s 17,000 square feet at 1730 Rhode Island Avenue is divided among five firms with offices ranging from 1,000 to 5,000 square feet. In addition to Search for Common Ground and Friendly, the first cohort of coveHQ tenants include a public boarding school called SEED (operations are at coveHQ and the school is in Southeast, D.C.), a tech firm and a progressive advocacy group (both companies asked not to be named for privacy reasons). The total square footage also includes two large conference rooms that the firms share. Search for Common Ground signed a service agreement to pay $33,200 per month, according to Fondak. The fee is “a bit more expensive for the square footage count—about 5 or 10 percent” than another space the firm was considering, but it was a “more economical deal for the services that they provided as well as the shared space that they brought to the table,” he said. Friendly, the smallest company, pays $5,550 per month, Nover said. While the coveHQ’s fee is more expensive than its previous space, Nover said it’s worth it.